When you run a course evaluation or survey in Questionmark Perception, you will likely want to make responses anonymous so that people will give you the candid feedback you need. But what if you want to make sure that each person takes the survey just once? 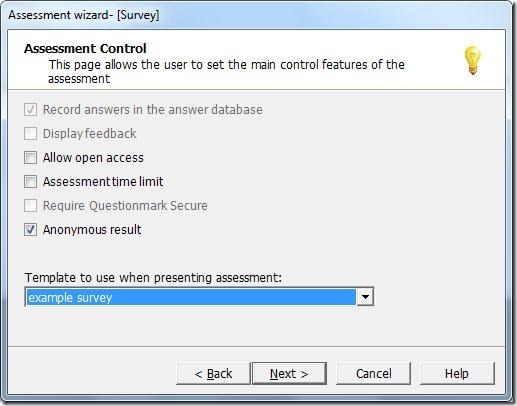 Can you control access to a survey and still make the results stay anonymous? Yes! When creating the survey, check off the box that says Anonymous Results. Double check your Special Fields to make sure they don’t contain identifying information. Take a dummy survey and confirm that you cannot see the results when reporting. Schedule participants just as you would for any assessment and have them log in. You can even use Email Broadcast to invite participants and send reminders. The survey results will give you participants’ responses but not their names or other identifying information. Learn more about how to report on survey results using Perception’s Survey Report and the Course Summary, Instructor Summary, Class Summary and Class Detail reports in Questionmark Analytics.